At the ripe age of 51, when many of her friends were thinking of retiring, Ann Maybin made the unusual decision to begin a whole new adventure by starting her own business – The Churchtown School of Music (CSM) – located in the leafy suburbs of Dublin. As her company celebrates its 10th birthday, WMB caught up with Ann to see how her love of music has developed into a thriving family interest. 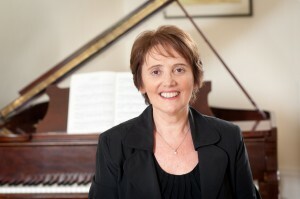 Born and raised in Co. Derry, Ann began her career as a music teacher in England and Northern Ireland before meeting her husband Colin, and moving to Dublin. “I had never learnt Irish so couldn’t take up a Department of Education job as in 1984 you weren’t recognised as a qualified teacher with no Irish!” Ann subsequently taught music in private schools and became an examiner for the Royal Irish Academy of Music. With all the traits of a self-confessed Leo – Ann has honed her abilities to achieve her goals. To ‘would be’ entrepreneurs, she offers some advice: “Be prepared for sleepless nights and long hours. For the last ten years my finishing time was 9pm every night!” Sound advice indeed!